The adventures of park ranger Anna Pigeon have filled the pages of 16 books, and now her legion of fans can find out how her story began. Grieving the death of her husband in 1995, Anna leaves NYC to take a seasonal position (cleaning toilets and hauling trash) in Glen Canyon National Recreational Area. This prequel takes readers where they've wanted to go for years - to Anna's beginnings as a park ranger. Anna emerges from this canyon escapade as a strong, determined woman who plans to return to the park service as a law enforcement ranger. I started this series because of the National Park settings and continued for Anna - this is the missing piece. 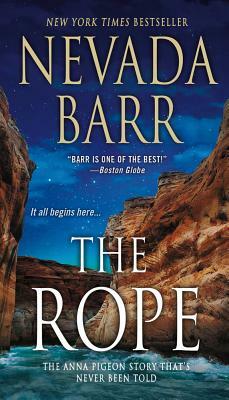 Nevada Barr is the author of the series of New York Times bestselling novels featuring Anna Pigeon, a law enforcement park ranger. Her novels include Winter Study, Borderline and Burn. She won the Agatha Award for Best First Novel for Track of the Cat. Like her character, Barr worked for the National Park Service as a park ranger before resigning to write full time. She had postings to such parks as Guadalupe Mountains National Park in Texas (where Anna Pigeon was created) and Natchez Trace Parkway in Mississippi. She lives in New Orleans.